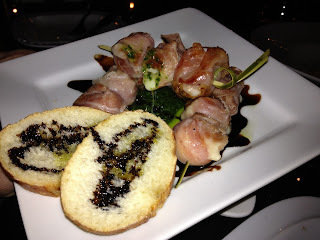 Although I had tried Lit Wine Bar’s food very briefly at their first appearance in the 2011 Taste of Edmonton, and had thoroughly enjoyed their bocconcini wrapped with prosciutto, I had never managed to visit their actual restaurant. So when @thepolishviking and mooself found ourselves seeking sustenance in the area of 104 Street we opted to visit Lit Wine Bar when our first choice, Tzin Wine and Tapas was ruled out since we lacked the foresight to make a reservation. A sleek, modern wine bar, the majority of the first level consisted of cozy booths and banquettes. We opted for a cozy booth and were immediately greeted with a small bowl of addictively salty popcorn. We decide to start with a caprese salad, and were presented with a beautiful plate. As good as it looked, it did not live up to expectations. 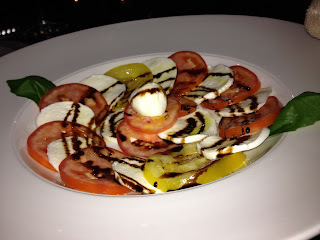 The tomatoes were under ripe, resulting in an overly crisp texture, the bocconcini was watery tasting, and the whole dish could have used more balsamic vinegar drizzle to give it flavor. The prosciutto wrapped bocconcini that I had looked forward to trying again could have benefited from more salt. The prosciutto itself was unlike any we had seen before, it looked and tasted very fatty, with the appearance resembling more of fatty bacon than that of prosciutto. The biggest disappointment and shock of the night for my human companions was the feeb carpaccio, which was served to them frozen. Yes you read right, frozen. They poked and prodded it with a fork initially, trying to figure out what the crunching noise was. Upon closer inspection, they could actually see ice crystals. It was confirmed when they put it in their mouth and found it was extremely cold and still mostly frozen. Update for clarification: It was not frozen a little bit so it could be sliced more easily, but frozen through and through and not even room temperature when served to us. Neither of the humans had ever been served feeb carpaccio this way before, and was later confirmed by Chef friends that it should never be cold enough to have ice crystals. We wondered perhaps if there was no Chef in the kitchen that evening and if everything had been prepped earlier, allowing others to simply plate the dishes. Regardless, we thought the free popcorn was the highlight of the entire meal, and that their food definitely could have used more attention. From the use of the right components to their freshness, the dishes could have benefited if more care had been taken in this regard. 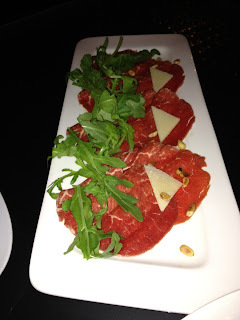 However, the frozen feeb carpaccio was really unforgivable in their eyes, as carpaccio should only be served fresh since it is raw meat, and it obviously wasn’t in this case since it was frozen. Lit Wine Bar although not the worst food we have tasted, lands fairly low on my list for daring to serve @thepolishviking and my female human raw feeb that is far from fresh, which could potentially make people sick. Although we hoped this was a REALLY REALLY off night for them, unfortunately the impression they made on us as diners was bad enough that I highly doubt that either @thepolishviking or I would return. I am curious if management was notified during your visit and given the chance to address the issue? It hardly seems fair to go straight to the Internet with complaints without first bringing them to the attention of the restaurant. Beef Carpaccio is more often thn not frozen to allow for easier slicing. It is also quite often preplated and finished to order. It is very likely your order was simply rushed. The meat was likely not dangerous and only need a few more minutes on the plate to thaw before being served. It seems reckless to accuse a restaurant of serving you something "dangerous" without knowing all the facts. That being said if you are worried that a restaurant made you sick it is important that you contact them and health services ASAP so an inspection can take place. We didn't speak with management, but did let the server know we were dissatisfied with the food. Also, the fact that most of the food was left uneaten should have prompted the server to inquire further, as well as to let kitchen staff know of our dissatisfaction. It's good to know it wasn't dangerous, and I'm well aware that carpaccio is often frozen for a bit in order to slice easier. However, after consulting with Chef friends, we are informed that it should not be frozen to the point that ice crystals are able to form. Also, they didn't make us sick, if you'd read closely, I stated that serving raw meat wrong could potentially make a person sick, and that the restaurant needed to keep that in consideration and make sure they serve raw meat properly. Thanks for reading and commenting, however I would appreciate if you would not comment based on conjecture as opposed to what was actually written.